Today, nearly four decades and a million miles later, Willie, 47, continues to heed the call of the highway. Overtaken by success a mere five years ago with the release of his album Red Headed Stranger, he simply picked up the tempo and put his foot to the floor. Once branded an outlaw by Nashville’s rhinestone-encrusted music establishment, Nelson has lately become an inadvertent and unassailable national monument. No one really objected when Willie dropped a lyric from The Star-Spangled Banner at the recent Democratic National Conveniton. Since Stranger went platinum in 1976, Nelson has added two more platinums, two double platinums, four golds and a whole atticfull of Grammys and Country Music Association awards. Currently, with seven LPs on the charts plus his new double LP Honeysuckle Rose, Willie has taken his guitar and his low-key persona and is trying his hand at being a movie star. Graduating from high school at 16, Willie left the cotton fields for a job as a disc jockey. “When I found myself singing over the radio, I didn’t think life got much better than that,” he recalls. For a while it didn’t. He joined the Air Force in 1950, but was discharged with a back injury. Afterward he enrolled at Baylor University, but spent most of his single semester there playing dominos.Â Dropping out, he was earning as little as 50 cents a night with a local band when he met and married Martha Matthews, a 16-year-old Waco carhop, in 1952. “She was a full-blooded Cherokee.” Willie recalls, “and every night with us was like Custer’s last stand. We’d live in one place a month then pack up and move when the rent would come due.” By 1958 Willie had three children to support. He made ends meet, after his fashion, as a plumber’s helper and a door-to-door salesman, while working nights playing his songs in the honky-tonks. Several painful chapters were inspired by his second marriage, to country singer Shirley Collie. Husband and wife sang, recorded and traveled together until settling down on 200 acres near Nashville in 1964. There Willie blew a small fortune fattening hogs (“I bought them for 25 cents a pound and ended up selling for 17”) while performing at the Grand Ole Opry. 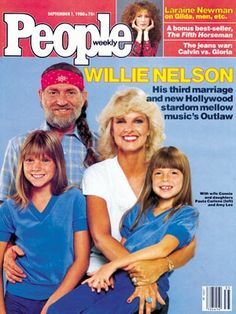 When Willie hit the road again to recoup his losses, he left Shirley at home to take care of his kids. Both drifted into smashing up cars, drinking, drugs and infidelity until the marriage simply died of neglect. By 1970 Shirley had moved out and Connie had moved in, but Willie’s career was going nowhere in Nashville. Then his house caught fire. “By the time I got there, it was burning real good,” Willie remembers, “but I had this pound of Colombian grass inside. I wasn’t being brave running in there to get my dope — I was trying to keep the fireman from finding it and turning me over to the police.” Willie saved the grass, but lost more than 100 tapes of songs he hadn’t yet recorded. Still, out of the ashes came a sense of relief and a determination to abandon Nashville for Texas. Installing his family in Austin, Willie bought a used Greyhound bus and began touring the county fairs, dance halls and violence-prone bars where he was known and loved. There was a time when Willie’s definition of a successful performer was “anyone who got to play music and eat.” Today he says, “I have all the material things I need and a couple I don’t.” When their life in Austin became oppressively public, he, Connie and their two children moved to Colorado in 1977. There Willie can hang his hat in a three-story chalet on 60 acres near Denver or at the family’s 64-acre Pedernales Country Club outside Austin, an 80-unit apartment complex, the 1,700-seat Austin Opry House and the previous Nelson residence — a 44-acre spread with $750,000 limestone ranch house hidden behind a wall topped with electrified barbed wire. Around Nashville, his holdings include a music publishing company and 200 acres outside town. This entry was posted on Sunday, May 21st, 2017 at 8:56 am and is filed under Amy Nelson, Connie Nelson, Magazines, Paula Nelson. You can follow any responses to this entry through the RSS 2.0 feed. You can leave a response, or trackback from your own site.